As the diffusion of ICTs increases, governments around the world are rolling out e-government plans and projects to enhance service delivery to the public through the use of ICTs. In many jurisdictions, both the financial and technical means available to government are limited. This constrains the ability of governments to deliver the benefits of e-government to everyone. However, there are significant pools of funds and expertise that the public sector can tap to deliver its obligations to deliver the highest level of public service at a reasonable cost. 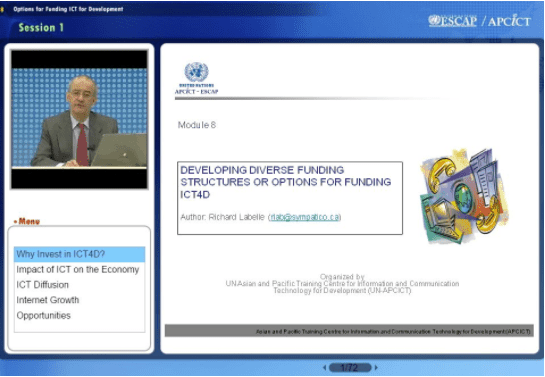 This module discusses these alternative funding options for ICT for development (ICTD) and e-government projects. Public-private partnerships (PPPs) are highlighted as a particularly useful funding option for ICT-based services and e-government initiatives in developing countries. Outline the issues to consider when deciding on which funding option to pursue for ICTD and e-government projects. Develop a draft ICT project funding proposal that considers some of the main concerns donors may have about funding ICTD activities and e-government projects. Richard Labelle is an independent consultant based in Canada. He has almost 30 years of experience in institutional strengthening and information and knowledge management in developing countries. Since 1992, he has undertaken missions to over 60 developing countries on behalf of UNDP and other organizations working in international development. In his consulting practice, he has advised governments, international development agencies, and other development actors on using appropriate ICTs and management practices for meeting national development goals. His current focus is on governance and public administration modernization and reform. He has undertaken evaluations of Internet connectivity and ICT capacity in various countries. He has also participated in the development of ICT strategies and action plans in parts of Asia and Africa, including Azerbaijan, Botswana, Djibouti, Gabon, Mauritania, Mongolia, Rwanda, Trinidad and Tobago, and Uzbekistan.